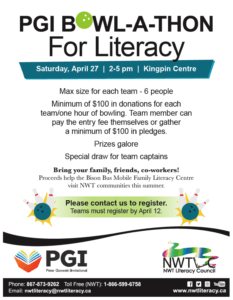 The PGI Bowl-a-Thon for Literacy fundraiser is April 27 from 2-5 pm at the Kingpin Bowling Centre. Prizes galore. Special draw for team captains. Gather five friends and bowl for an hour. Minimum $100 donation or pledges for each team. Teams can be up to 6 people. Registration forms at www.nwtliteracy.ca. Or call 873-9262. The money raised will buy supplies for the Bison Bus mobile family literacy centre. Great fun for your family, book club members, co-workers.